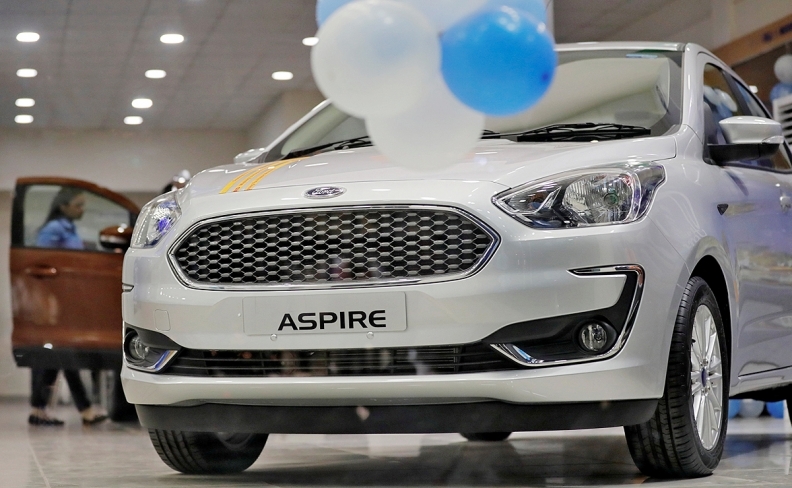 A new Ford Aspire car is on display for sale inside a showroom in New Delhi, India, Nov. 1, 2018. NEW DELHI -- Ford Motor made a profit in India for the first time in a decade in the last fiscal year, signaling that a strategy conceived two years ago by the U.S. car manufacturer for one of the world's most competitive car markets is starting to show some success. The success of India's top carmaker Maruti Suzuki, a unit of Suzuki Motor Corp. that sells one in every two cars in the country, has been built on having a wide range of products, low prices, a vast dealership network and an autonomous local team that can quickly react to market changes. Its nearest competitor is Hyundai Motor Co. with a 17 percent market share, which has had better success than some of its American and European rivals such as General Motors, Fiat Chrysler and Volkswagen Group.